Some of you will have seen the 2007 film starring Hilary Swank, 'Freedom Writers'. It was based on the real-life experiences of a young, untested teacher given a class of bored, anti-social high school students, none of whom had much hope of graduating. 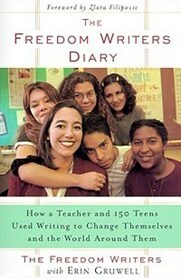 Shocked by the racial tensions in the class between members of different gangs, the teacher, Erin Gruwell, bitterly complained that the stereotypes the students used to characterise each other along ethnic lines reminded her of the Holocaust. Nobody knew what she was talking about. This post is the story of how that teacher used reading and writing to change her students' perceptions of each other and to get them through high school. Most of us have had classes which have made us dread going to school on the days we had to teach them. A colleague in a Gulf university prep year used to refer to his as 'Knife Fight 101', for instance. Erin Gruwell's class was one for no-hopers who had little interest in or prospect of successfully completing high school. At the cost of her free time, marriage and, at times it must have appeared, her sanity, this astonishing woman not only defied all the odds against these teens graduating, she - and they - turned many of their lives around. She did so by overcoming their mistrust of each other. 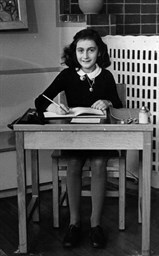 And she achieved this through interesting them in two books (only one of which is featured in the film): 'The Diary of Anne Frank', the Jewish girl hidden in an attic in Amsterdam during the Nazi occupation of Holland, who later died in an extermination camp; and 'Zlata's Diary: A Child's Life in Sarajevo'. 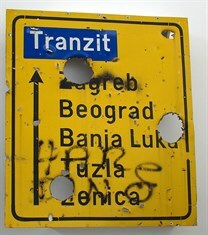 (Zlata managed to survive the Serbian-Bosnian war in the '90s and now lives in Paris.) Both diaries, of course, feature the horrors of war and were written by victims of racial persecution. Buoyed by the fascination her students had shown in the diaries, Erin set about getting them to write about their own day-to-day lives. She sent some excerpts from these to Miep Gies, the woman who had sheltered Anne Frank in her attic in Amsterdam. The teens also raised the money for the very elderly Ms. Gies to fly to California to talk to the students about her experience with the Frank family. It was during one of these talks when Ms. Gies refused to admit that she was a heroine but called the kids heroes instead because of what they lived through every day. Engaging with the teens' lives, with the realities they were living every day, was the way Erin Gruwell reached out to them, got them involved with reading and persuaded them to make the effort to study for their high school diplomas. It's difficult to imagine the very demanding sacrifices she and especially the teens had to make to achieve so much. But, for those of you who are interested, there's a book of their experience written, of course, in their own words: 'The Freedom Writers Dairy' by the Freedom Writers and Erin Gruwell (Random House, 1999) or, of course, for those who can't get the book, there's always the film. Book and film are a remarkable testament to a teacher who engaged with the very undesirable students she was assigned, rather than wishing she had better raw materials to work with. All Erin Gruwell's class got high school diplomas and many went on to university.